If you’re looking to soak it up the right way, we have good news for you — Spa Hearth & Home carries Bullfrog hot tubs in New Jersey! Of course, if you’ve been following any of our blog posts, then you would know based on our most recent post about Bullfrog hot tubs and home spas that we were going to follow up with this promised post. Alas, here we are! Our original post didn’t go into close enough detail about the Bullfrog home spa difference, and that’s what we’ll be highlighting below. If you have any questions based on our last blog post or any general inquiries, don’t hesitate to get in touch with our Maple Shade Bullfrog hot tub dealers today! Let’s continue where we left off. Though using minimal amounts of energy may not be the top criterion in finding the perfect hot tub, it’s still one that you’ll want to consider as a homeowner and especially as a business owner. Think about it: if you’re running your hot tub at all times during the day and night — whether or not the temperature is turned up — you’re constantly using energy. Why pay more than you have to in order to power your home spa? Due to the fact that Bullfrog’s JetPak Therapy System uses up to 90 percent less plumbing than competitors, coupled with their full foam design, a single lounge spa from them uses a lot less electricity. Integrated into the design of every Bullfrog hot tub and home spa is their signature EnduraFrame™ wood-free structure. Constructed without metal or wood, you’ll never have to worry about your hot tub rotting or corroding. Additionally, the sturdy structure of the frame will always ensure that the thousands of pounds of water stay where it should. The only thing you have to worry about is absolutely nothing because you’ll be too distracted by relaxing! Back with another proprietary system from the leaders in hot tubs, Bullfrog builds their hot tubs with their WellSpring™ water care system. Designed to work in tandem with sanitation agents and a dual filter system, you’ll also never have to worry about any contaminants. Plus, Bullfrog filters are easy to access for routine cleaning. It doesn’t get much better than that. In our last post, we highlighted the JetPak Therapy System™ and why it’s so incredible. We wanted to reiterate this important aspect of Bullfrog hot tubs because there are some 16 JetPaks to choose from, ensuring that you’ll find a jet system that fits you best and offers features that you’re really looking for. The best part? Bullfrog hot tubs are designed to allow these jet packs to be easily swapped out and interchanged, so your options are unlimited! Work With Our Bullfrog Home Spa Dealers In Maple Shade Today! 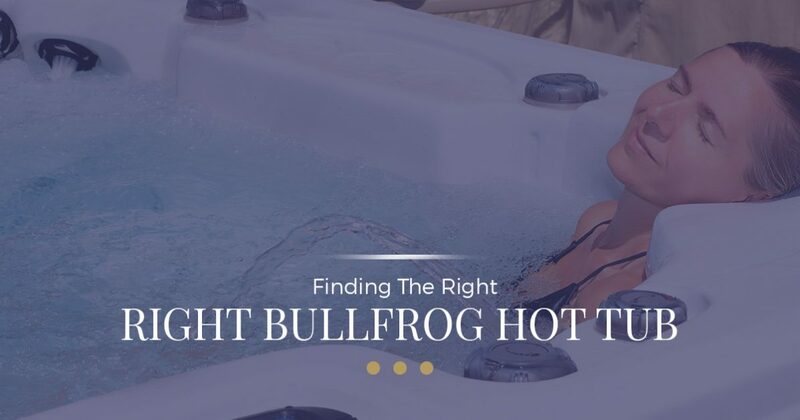 If you’re local to Maple Shade, New Jersey, or the surrounding area, Spa Hearth & Home wants to help you find the Bullfrog hot tub of your dreams. Get in touch with us today to get started! Check Out Our Guide To Relaxation Here!